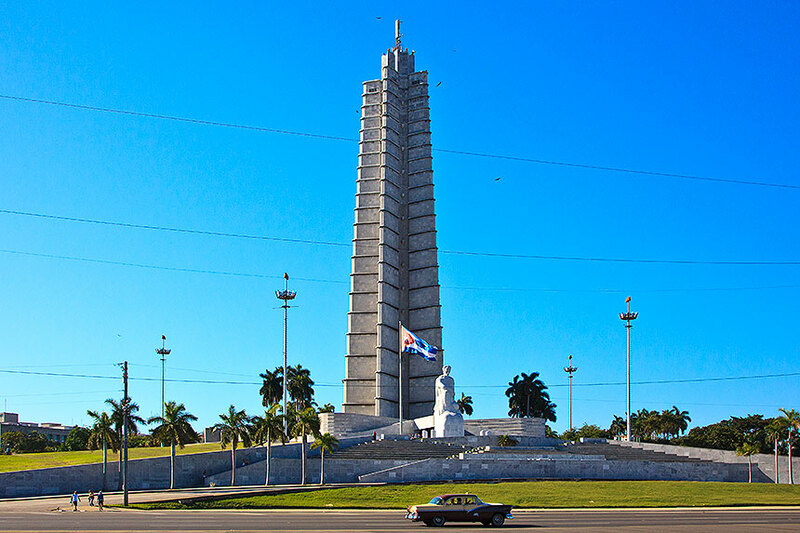 Lest Cubans forget about their successful revolutions (both from the Spaniards and from the Batista government), reminders are everywhere. 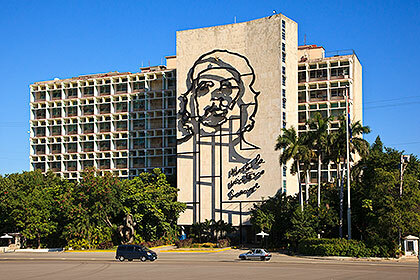 These three images are from Revolution Square (Plaza de la Revolucion). 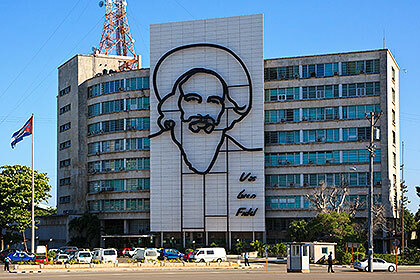 Above is the Memorial Jose Marti, while figures of Che Guevara and Fidel Castro adorn the Ministry of Interior (below left) and Ministry of Communications (below right). 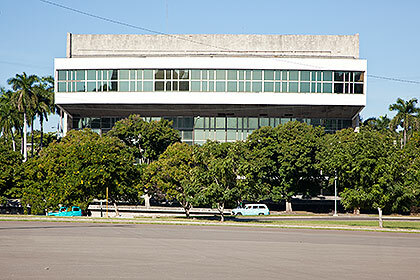 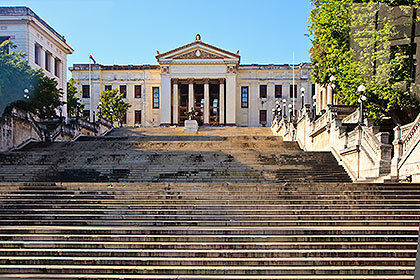 Also at Revolution Square are the National Theater (left) and the University of Havana (right), which was founded in 1728. 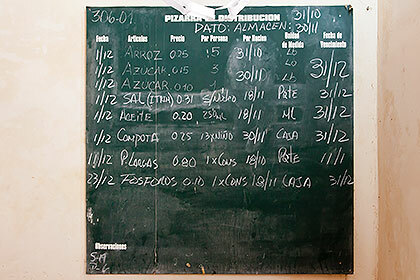 Education is free at all levels in Cuba. 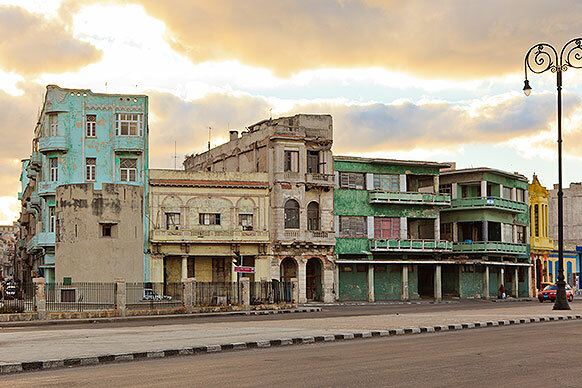 Apart from free education and culture (and medical care) there are other realities of life for Cubans living under the Castro regime and the American embargo. 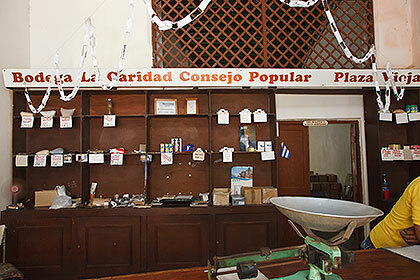 Basic foods such as beans and oil and flour are rationed and available (sometimes) at stark Bodegas, such as the one above. 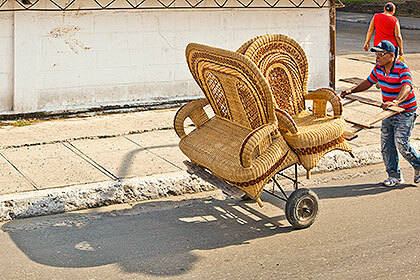 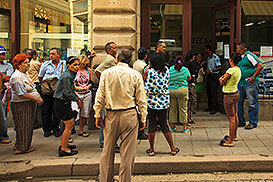 Though such basics are free, many other needs of life must be obtained within very meager incomes for most Cubans. 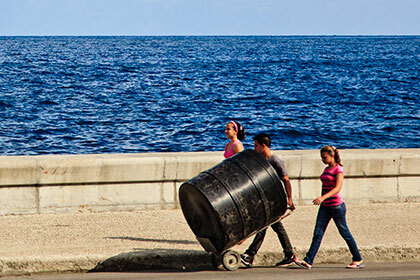 Jobs are available for all Cubans who are willing to work, but monthly salaries start at the equivalent of around US$9.00. 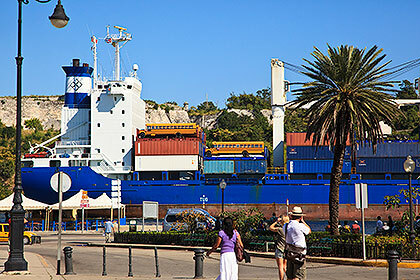 Most manufactured goods must be imported, and arrive by ship. 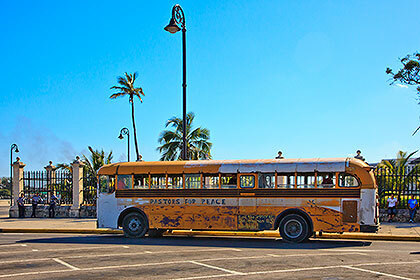 Some American charitable organizations, such as Pastors for Peace, defy the embargo and bring humanitarian "friendshipments" into Cuba. 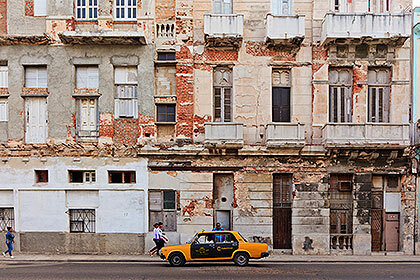 Since the "special period" started in 1991 (at the collapse of the Soviet Union and loss of its subsidies), the tourist sector has been expanded to bring in hard currency from abroad. 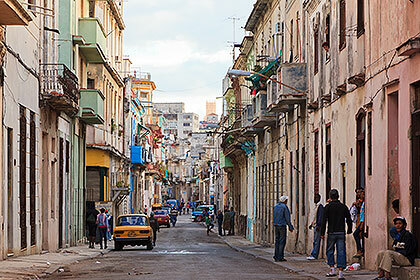 Cuba is a vacation spot for many Canadians and Europeans, and even US citizens can go there now (within restrictions). 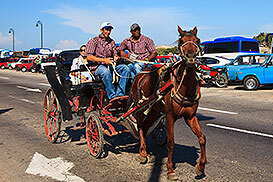 Along the Malecon (above and below) we see parked tour buses, and tourists in horse drawn carriages and "coco cabs". 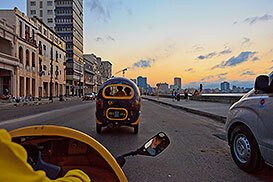 The Malecón is a seawall, promenade and roadway along the coast at Havana. 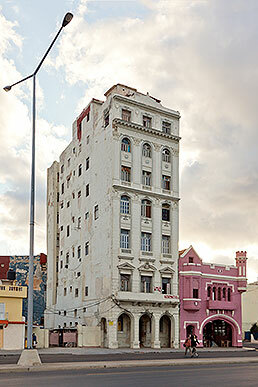 Completed in 1902 (during the American occupation of Cuba), it was not intended to be a major thoroughfare, but soon became the preferred link between the old and new parts of Havana. 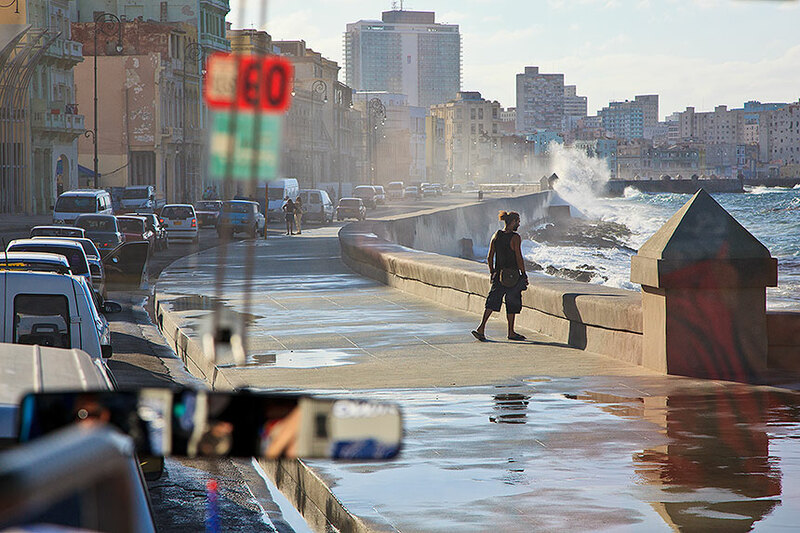 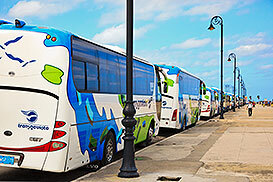 Above, we see waves crashing against the seawall as our tour bus makes its way through the Havana traffic. 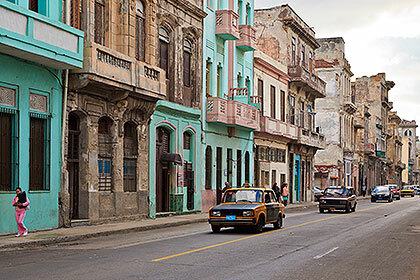 With high cost and meager supply of both trucks and fuel, deliveries are made with human (and sometimes horse) power, as much as possible. 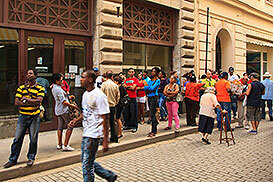 Cubans are accustomed to long waits in long lines. 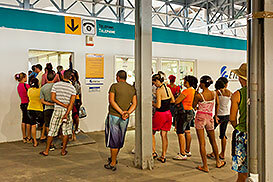 Above, they queue up at different places for a chance to get cellphones. 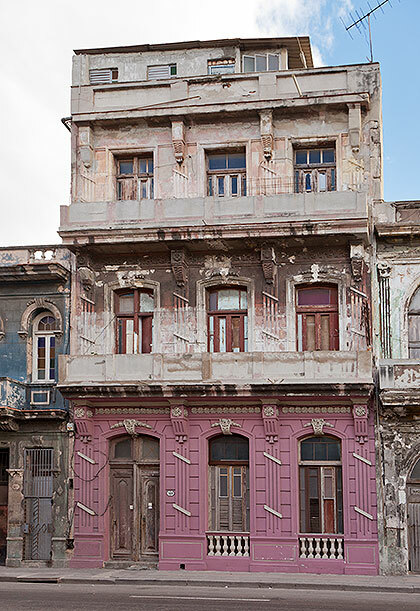 Buildings at some stage of reconstruction or repair are common, but we seldom see any actual work being done. 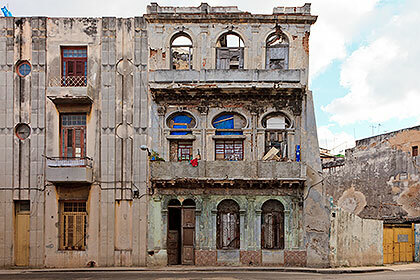 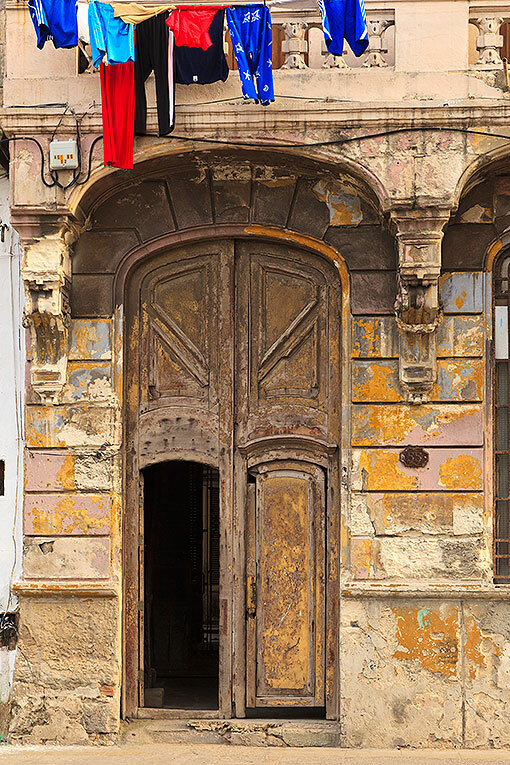 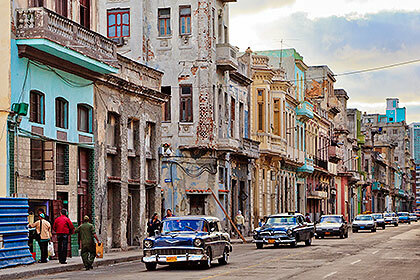 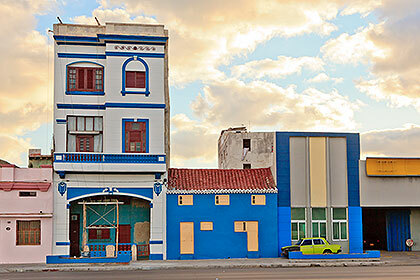 Cubans have had to become accustomed to drab and dilapidated surroundings. 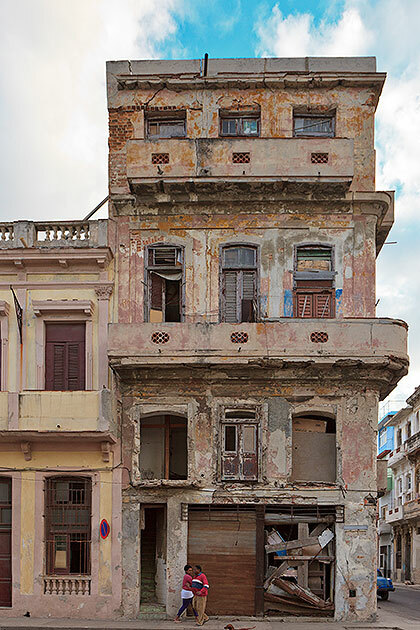 Since the buildings are all owned by the government, and personal incomes are low, there is little incentive for individual citizens to make significant repairs or improvements. 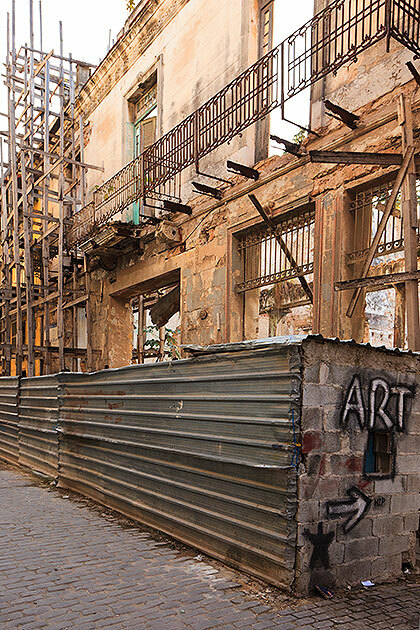 Everything is on hold until the government gets around to it. 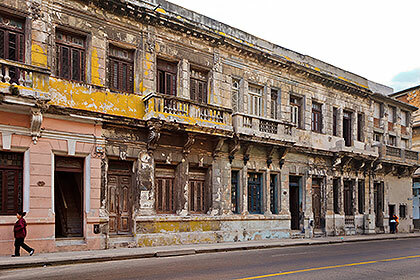 (Above 2 pictures and 8 below) On San Lazaro Street (just one block away from the Malecón) we photograph some of the buildings we see as we walk toward the Hotel Nacional. 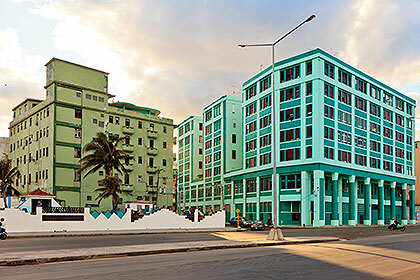 Back on the Malecón again, things are in a bit better repair.